80% of the universe is composed of Hydrogen. It is part of every living thing and in every drop of water; without hydrogen, life could not exist. Hydrogen is combustible and has been used as a fuel for millennia. Hydrogen is derived from the Greek ‘hydro genes’, meaning water forming. A colorless, odorless gas that burns or explodes when mixed with air. Currently, Hydrogen is derived from two sources: from methane gas, and by electrolysis of water. The gas is used to make key manufacturing materials such as: ammonia, cyclohexane, and methanol, which are intermediates in the production of fertilizers, plastics, and pharmaceuticals. Some see hydrogen gas as the clean fuel of the future - generated from water and returning to water when oxidized. The common argument against hydrogen is it takes as much energy to produce hydrogen as you get out of it. This is only true if you use fossil fuels to produce it. There are other ways to produce hydrogen such as wind, solar, geothermal, biomass, and SLOW MOVING WATER. At SLOW MOVING WATER we feel our system for making hydrogen solves the current problems for producing and using hydrogen to meet our civilization's energy needs. Our production process is the most effective way to produce hydrogen and our method of storing large amounts of hydrogen energy in a small space is unique. Hydrogen is contained in almost everything around us but is rarely found in its pure form. Most of the time hydrogen comes bound up with other elements such as natural gas and water. Therefore, to obtain pure hydrogen an extraction process takes place and this requires energy to break the bonds that hold the compounds together. Today, 95% of the hydrogen used in the hydrogen industry comes from natural gas* through a process called steam reformation. Natural gas is comprised of hydrogen and carbon, and the reformation process produces destructive greenhouse gasses. In addition, natural gas supplies are limited and this source and process are not seen as a long-term solution to our current energy problems. An improved, long-term method to extract hydrogen is using water as the source and electrolysis as the process. This solves many of the supply and emission problems of using fossil fuels, but where do we obtain the electricity for the electrolysis? Slow Moving Water has solved this problem by combining old and new technologies. The old technology uses the force of gravity found in moving water. This modern watermill is the source of energy that turns the turbines that create the electricity used in the electrolysis process for making hydrogen gas. The new technologies are in advanced electrolysis currently in use. 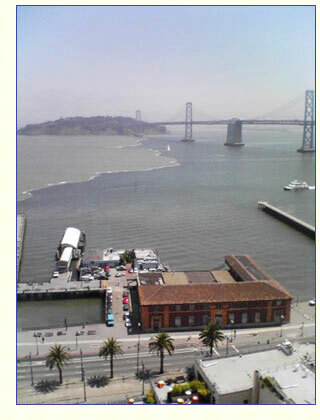 There is an added benefit, location. Hydrogen power plants can be made on the local level because suitable slow moving water is found in many parts of the world, along rivers and in ocean tides. The process of the electrolysis of water is observed by passing direct current from a DC power supply through a container of water (in practice a saltwater solution increases the reaction intensity). 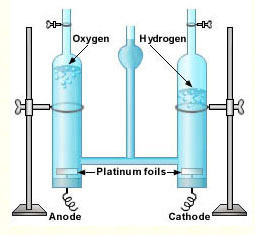 Using two platinum electrodes, hydrogen gas will bubble up at the cathode, and oxygen will bubble up at the anode. These gases collected separately are stored in metal containers. Storage of hydrogen brings up the next amazing SMW technology - metal hydrides. Much of the energy in fossil fuels comes from the hydrogen bound up in their chemical structure. Gasoline, for example, is a particularly efficient form of fossil fuel because it has a large amount of hydrogen bound up in a small volume. This makes gasoline particularly useful for cars because space is very limited for storing the energy needed to propel a car. But burning gasoline produces a wide range of environmentally dangerous byproducts and leaves civilization dependent on a limited source of fuel. Instead of releasing the energy of hydrogen by burning fossil fuels, a more effective way of using hydrogen as a fuel is to use it in its' pure form. Hydrogen in its' pure form burns clean, producing byproducts of pure water, heat, and small amounts of nitrous oxide. But burning hydrogen is not very efficient because much of the energy released through combustion is in the form of heat which is great for electric power plants, but not useful for propelling vehicles. The efficiency of combusting hydrogen can be as low as 20%. Thus, it takes a large area to store the large amounts of hydrogen required to propel a car. Scientists are now attempting to solve this problem by creating fuel cells. SMW has solved this problem with the use of hydrides; metals that store large amounts of hydrogen in small spaces, which we will discuss in a moment. Fuel cells are a more efficient way of releasing energy from pure hydrogen. In the electro-chemical reaction, hydrogen and oxygen combine without combustion to form water and release electrical energy in the process. This electricity is then stored in a battery to be used as a fuel to drive cars, turn on lights, and help us live our high tech lives. This process produces much less heat and more combustion, so more energy is available for use. However, it is often the case that it takes as much energy to produce a fuel cell as you reap. In addition, the fuel cell process of releasing the energy from hydrogen is barely adequate to fulfill the energy needs of today's energy hungry world. Let's go back to combusting hydrogen as a way to release the energy from pure hydrogen. Remember the problem is the need to store large amounts of hydrogen to reap a little energy. The solution therefore is in getting large amounts of hydrogen in a gaseous form into a small space. Research has proven that hydrogen can be stored in metals, like a sponge stores water. These hydrogen sponges, called metal hydrides, can store 40 to 900 times their weight in usable hydrogen energy. Adding hydrides to hydrogen storage containers (whether they be for a car, a boat, or a plane etc.) means there is up to 900 times the amount of energy available from the same space. It also eliminates the need to compress the hydrogen into over pressurized containers. 2 ounces of palladium can store 112 lbs of hydrogen = 8.9 million BTUs of energy. Hydrides are the key to solving the problem of using hydrogen as a source of energy. Today hydrogen is currently a $50 billion a year industry and is used extensively in the industrial, transportation, residential, and farming industries. Hydrogen, primarily used to manufacture petrol fuels, is an additive to give fuels better combustion, and not used as much as a fuel in its pure form. However, hydrogen has the ability to meet the demand of supplying the enormous energy needs of today's world at a low cost in the near future. Hydrogen is produced from almost any source of energy not just fossil fuels. Wind, solar, geothermal, biomass, and slow moving water are forms of energy that are used to generate hydrogen through electrolysis. These forms of energy have a significantly less effect on the environment than fossil fuels. These "alternate" sources account for only a small percentage of the energy we use today (2%), but that percentage is growing and will inevitably continue to grow as oil costs rise and supplies dwindle. Using the electricity generated from alternative sources solves the problem of hydrogen costing too much to produce. The trend is to diminish our dependence upon fossil fuels while bringing alternative sources online. The cleanest, most productive natural energy source is slow moving water; and it represents a convenient way to convert our current fossil fuel energy system over to a safer one. If we continue using fossil fuels to make hydrogen or if we continue to use fossil fuels as our primary way to supply our energy needs we will continue to fuel more than just our cars and buildings, we will fuel the death of our planet. Oil spills, air pollution, explosions, deadly chemicals, super fund sites, acid rain, are all a part of the total pollution picture that fossil fuels bring. The harm to our planet is obvious, and it is even more obvious that our civilization needs to turn to new sources for our energy supply. The energy source of slow moving water to manufacture hydrogen is evolving the alternative energy industry. Slow Moving Water, Inc. is encouraging a bright future, a future free of polluting fossil energy sources. The manufacturing of hydrogen from slow moving water allows us to remove emissions from the tail pipe of 800 million cars, heat our homes, and produce clean electricity, and it is possible now, not in the distant future. * Almost all of the 40 million tons of hydrogen used worldwide today comes from natural gas though a process called reforming. Natural gas is made to react with steam, producing hydrogen and carbon dioxide. The hydrogen is then used: to make ammonia for fertilizer, in refineries to make reformulated gasoline, and in the chemical, food and metals industries.